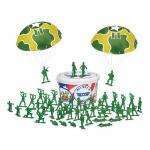 Aside from a toy story logo I'm not sure how these differ from the cheap plastic soldiers I got as a kid, as said above available in most pound shops. Its the same with mostof the Toy Story merchandise, they're generally based on real toys that are readily available - slinky dog, mr potato head, etc. yep, toys r us sell these for silly money but they also sell 99p packets of soldiers which are the same if not better quality. you're paying for the label on the plastic container. That's dire value for money. Just for the record, we have these and the cheap ones, and the Toy Story ones are so so so much better..well worth the money and more I would say £12 in M&S and now sold out !!! "These are the Toy Story Collection set. They come in the box they had in the films. Same with the other Toy Story Collection toys. The main hint is in the name. They're for collectors]"
No, they're for kids. Or sad geeks.